Companion Bike Seat - Now your bike seats Two! NOW YOUR BIKE SEATS TWO! Transform your bicycle into a two-seater with Companion Bike Seat, the back seat for your bicycle! Supports passengers up to 200 lbs. Companion Bike Seats come with a locking, rain-resistant storage compartment beneath the seat. Great for storing your bike lock and anything else. 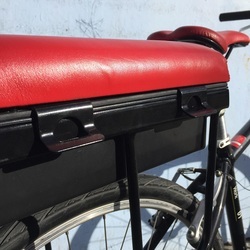 Companion Bike Seats are easy to install, and compatible with most mountain bikes, path-and-pavement bikes, cruisers, and many ebikes as well! "Consider this the cyclist's equivalent of a station wagon"
﻿﻿I wanted to thank you for making this wonderful product. I've just ordered it today. My bike is the only form of transportation for me and my daughter, and when she approached 40 pounds and can really no longer fit into the Co-Pilot, I started to sweat. Xtracycle costs a minimum of $400 for a cargo seat for a child, and your product does it and so much more affordable! Thank you thank you, thank you!!! Check out this new bicycle radar project we're working on called Velalert. ​Sign up to hear from us about specials, sales, and events.